As I mentioned in one of my previous posts, my plans were derailed due to bizarre weather. The South was hit with some freakish storms, the entire region from Virginia to Georgia was covered with snow and ice. 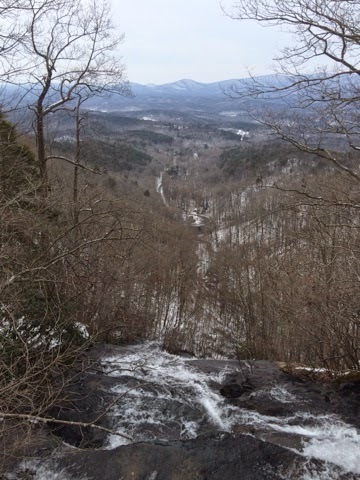 Because of this, I was unable to start my thru-hike at Springer Mountain and had to start at Amicalola Falls, hiking up 604 steps and continuing on the Approach Trail (adding an additional 8.8 miles). Before we even took our first steps (Joe is hiking the first week with me), we realized that we forgot our trekking poles back in the car that was parked in Hiawassee! Doh! Did we really just do that? Trekking poles are an important piece of gear, although not essential. The absence of them could make for a very unstable hike, especially on all the snow and ice we needed to traverse. Luckily, the Amicalola Visitor Center had a set of poles for sale and another set in a hiker box that we were able to take for free. As soon as we were finally all set, we started our way up, up, up the steps. A quarter of the way up I was thinking, “Are you kidding me? You’ve got to be kidding me!” But, we finished them, although feeling like we had just run a Spartan Race. 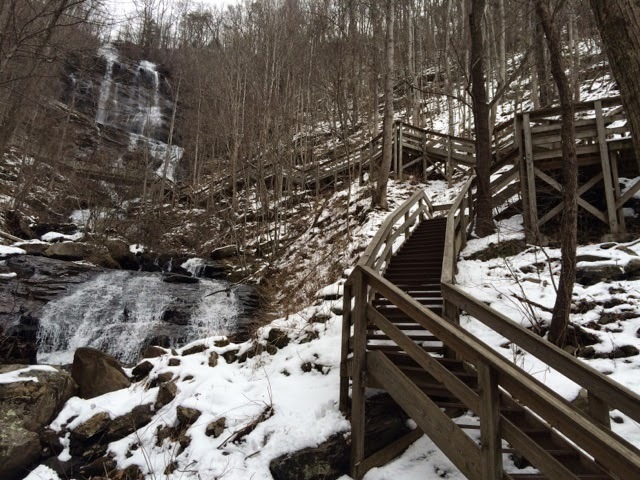 The first few hundred steps at Amicalola Falls. At the top of the falls. You can see the park road where we started. Then we continued on the approach trail that seem to climb on forever. As if we didn’t climb enough up those darn stairs, we now had to ascend up Springer Mountain. We never made it to the summit. 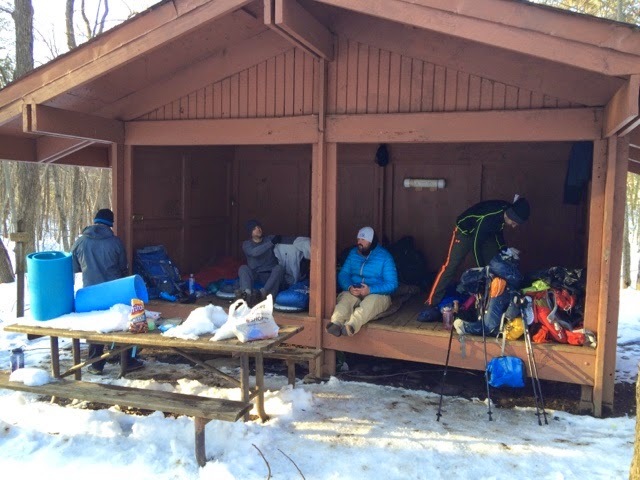 We ended up having to stop at Black Gap Shelter, just 1.5 miles from the summit. It was getting dark and we needed to be able to get ourselves situated before it started to get really cold. And cold it got. Actually, cold isn’t even the word. The night brought a bitter chill along with fog and an icy mist. There were 8 of us packed in the shelter like sardines in a can. There was no amount of body heat that eased the sting of wind blowing through the shelter walls. I slept maybe two hours, no more. It was like Chinese water torture, lying there waiting for the sun to come up, seconds ticking away slowly,..tick, tick, tick. The next day of hiking was miserable. I was tired from not sleeping all night. It was cold and wet, the air so heavy and thick with moisture. My asthma and the air was making me feel like an elephant was sitting on my chest. I couldn’t expand my lungs enough, with the pack compressing my upper body. The trail was mostly a sheet of ice. I had my MicroSpikes, but Joe was paying the full price of hiking without traction. We were set out for Hawk Mountain Shelter, about 9.6 miles away from the shelter we stayed at the night before, but again, we missed our mark. I just couldn’t go any further, so we ended up finding a place to camp about a mile short of the shelter. We found a spot off the trail and of course, it started to rain! REALLY?! Everything got soaked as we set up camp. The only things that we had dry were our camp clothes that we would do everything in our power to keep dry. Of course this means that you do not go out into the rain to pee with your camp clothes on. It was the middle of the night when I couldn’t hold it anymore. I had to pee or else my bladder was going to burst. I stripped down naked (yes, completely naked) and made a mad dash to relieve myself as quickly as possible. It was like an episode of ‘Naked and Afraid’. Thank goodness we were in the middle of nowhere so nobody would see this happening. It was two days that had passed and we barely made it 16 miles (not even 8 miles up the A.T.). This is harder than any hiking I’ve ever done. Actually, forget hiking, this is harder than anything I’ve ever done. It seems that you are constantly cold, wet, and tired. I’m waiting for someone to come along and say, it’s just a joke. It’s not really that bad. You only have ~6 months to go?…cake walk! 😉 Jk!! It looks so beautiful there. I love the photos. P.s. I didn't know Frito's were a hikers go to snack 😀 yum! Hang in there. You're doing great. I'm following along on your blog.